Dwebble in game: 3,447 Who? Important notice! Pokemon Dwebble is a fictional character of humans. Dwebble (Japanese: ????? 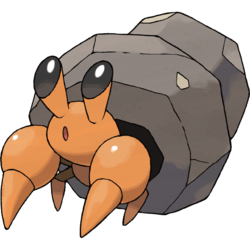 Ishizumai) is a dual-type Bug/Rock Pokémon introduced in Generation V.
Cilan captured Dwebble after helping it retrieve its shell from a trouble making trio of Dwebble in A Home for Dwebble!. Since then, Cilan has used Dwebble in various battles and was the Pokémon Cilan chose to use in the first round of the Club Battle in Cilan Versus Trip, Ash Versus Georgia!. 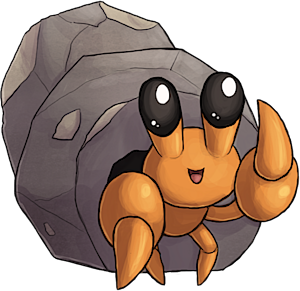 It finally evolved into Crustle during a battle against Team Rocket in Crisis at Chargestone Cave!. Three Dwebble appeared in A Home for Dwebble! where they bullied another Dwebble and stole its shell. Burgh used a Dwebble in his Gym battle against Ash in Battling For The Love of Bug-Types!. It defeated his Tepig but lost to his Sewaddle. A group of Dwebble also appeared in Genesect and the Legend Awakened at Pokémon Hills. They took a particular liking to Cilan's Crustle. 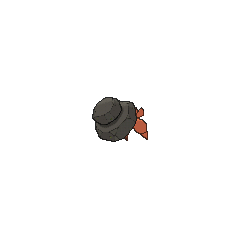 Multiple Dwebble appeared in Climbing the Tower of Success!. A Dwebble appeared in Curtain Up, Unova League!. Dwebble is based on a hermit crab, living within a hollowed out rock rather than a discarded seashell. Ishizumai may be a combination of ? ishi (stone) and ??? sumai (dwelling/house), referring to its habitat. Korean ??? Dolsari From ? and ?? Mandarin Chinese ??? Shíjuxiè Literally "Stone house crab".